Tha mòr-roinnean Chanada a' gabhail a-steach na deich mòr-roinnean agus na trì "territories" a tha ann an Canada. 'S e an cùmhachd a tha aig na mòr-roinnean an diofar as motha eadar mòr-roinn agus territory Chanèidianach. Fhuair iad an cùmhachd aca dìreach bho ban-rìgh tron Constitution Act, 1867. Tha na territories fo smachd riaghaltas Chanada fhèin. 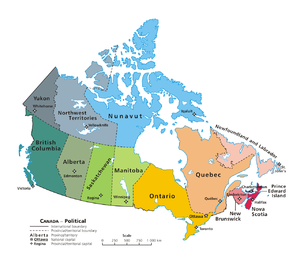 Seo sin na mòr-roinnean:Alberta, Columbia Bhreatannach, Manitoba, Brunswick Nuadh, An Talamh Ùr is Labrador, Alba Nuadh, Ontario, Eilean a' Phrionnsa, Quebec, agus Saskatchewan. 'S e Northwest Territories, Nunavut agus Yukon na trì territories a tha ann an Canada. Seo liosta de Mhòr-roinnean Chanada a tha a' sealltainn ainm na roinne, giorradan phuist agus giorradan eile, am prìomh-bhaile agus am baile as motha den mòr-roinn. Tha fiosrachadh eachdraidheil ag ràdh cùin a chaidh an roinn còmhla ri Canada. Cuideachd tha àireamhean ann mun fharsaingeachd gu lèir agus cia mheud duine a tha a' fuireach anns an roinn seo. Air a tharraing à "https://gd.wikipedia.org/w/index.php?title=Mòr-roinnean_Chanada&oldid=514680"
Chaidh an duilleag seo a dheasachadh 9 dhen Chèitean 2016 aig 14:28 turas mu dheireadh.